DDL releases for the Mac & Linux operating systems. 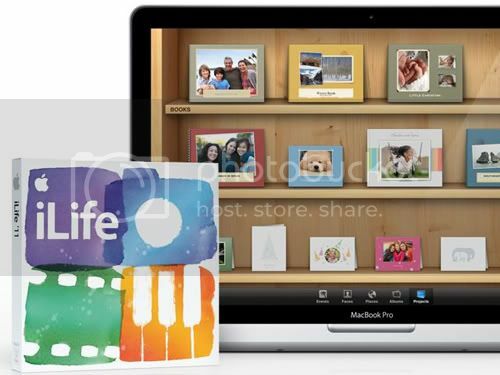 iLife 11 is a major upgrade to Apple's award-winning software suite. It includes new versions of iPhoto, iMovie, and GarageBand - three powerful yet easy to use applications that let you create amazing things with your photos, movies, and music on the Mac. With this latest release it's incredibly simple to share what you make with the world, whether it's a gorgeous photo book, a Hollywood-style movie trailer, or an original song. Completely immerse yourself in your photos onscreen and in print. Browse, edit, and share them with new full-screen views. Then take your best shots and turn them into gorgeous photo books. - Enjoy stunning new full screen views for Faces, Places, and Events. - Email a photo using beautiful Apple-designed themes. - Share photos on Facebook and see friends' comments in iPhoto. - Create gorgeous books and cards. See all your projects with ease. - Showcase your photos with six exciting new slideshow themes. Turn your home videos into epic movie trailers. Create TV-like sports highlights and news segments. Add special effects. And edit sound, too. iMovie makes you an indie filmmaker instantly. - Cut your very own Hollywood-style trailer with drag-and-drop ease. - Create the perfect soundtrack with easy-to-use audio controls. - Apply effects like slow motion and instant replay with a click. - Quickly find the clips you need with People Finder. - Give your video a TV-style look using the Sports and News themes. Suddenly, everyone can have rhythm. Now you have everything you need to make great-sounding songs including perfect rhythm, a good groove, and guitar and piano lessons. Are you ready to rock? - Tighten the rhythm of your recordings with Flex Time. - Match the groove of one track with another instantly. - Rock out with even more guitar amps and stompboxes. - Take 22 new Basic Lessons for guitar and piano. - See how you've performed and keep track of progress using "How Did I Play?" Designing a website may seem difficult, but with iWeb, it's easily within your reach. Create your site using themes. Customize it with photos, movies, text, and widgets. Then publish to MobileMe or any other hosting service. iWeb even notifies Facebook when your site changes and adds a link to your profile so your friends stay up to date. Create your own DVD in less time than it takes to watch one. With iDVD, you can premiere your movies and photo slideshows on a professional-quality DVD with animated menus, buttons, scene selection, and more. All customizable to suit whatever you're sharing. EVERY LANGUAGE SUPPORTED - NO BURNING, NO ZIP, NO RAR, NO CRACK NEEDED: Just open DMG and setup. THE LANGUAGE IS AUTOMATICALLY CHOSEN DEPENDING ON THE ONE OF YOUR OPERATING SYSTEM. 1.) Run/mount the .dmg file. 3.) Finish, and your welcome. - Mac OS X v10.6.3 or later. - Mac computer with an Intel processor. - Approximately 5GB of available disk space.